Milram's supersprinter Alessandro Petacchi was cleared yesterday by the Italian Cycling Federation after testing well above the threshold value for the asthma medication salbutamol at the Giro d'Italia. Petacchi is one of many cyclists who carry “therapeutic use exemptions,” documents provided by doctors that allow them to use substances that are generally off-limits to treat specific ailments. The Italian Olympic Committee recommended a 12-month suspension, but the disciplinary committee of the national federation said Petacchi could return to racing immediately. "The UCI will ask for the file and we will then study it once we receive it," said UCI chief Pat McQuaid. "We don't know all the details of the Italian federation's decision, but we will be making a request for the file in the next 24 hours." "It is a possibilty that we appeal," he added. Two separate doping investigations by the Italian Olympic Committee will bring Alessandro Petacchi, Danilo Di Luca, and Eddy Mazzoleni before investigators next week. Petacchi hopes to present his therapeutic use exemption for the asthma medication salbutamol and be cleared to race in the Tour de France, after one of his 5 doping tests from the Giro d'Italia came back with a salbutamol level of 1320 nanograms/milliliter. His other Giro tests were all below the trigger value of 1,000 nanograms/mL. Petacchi is suspended from competition until the committee reaches a decision, which puts him out of the Italian nationals and threatens his spot in the Tour. Di Luca and Mazzoleni will appear before the same investigator as Petacchi, Ettore Torri, as part of a hearing on what's been called the “Oil for Drugs” case, resulting from raids conducted during the 2004 (!) Giro d'Italia. Di Luca has already ruled out a Tour ride, after winning the Giro, but Mazzoleni, 3rd in this year's Giro, may be is suspended during the investigation, which would will keep him off the Astana squad. The case apparently took its name from evidence that some ridres may have been trading massage oil for performance enhancers. Italy's finest sprinter is back in training, and looking forward to 2007. Alessandro Petacchi, who missed the 2006 Tour while recovering from a knee injury sustained in the Giro d'Italia, then broke his hand during the Vuelta a España when he punched the team bus. Where many riders might consider that sequence and decide to stay away from the Grand Tours for a while, Petacchi says his 2007 goal is stage wins in each GT (a feat he accomplished in 2003) and a repeat of his 2005 win at Milan-San Remo. So the Gentleman Sprinter wasn't too happy with how the sprint worked out in Sunday's stage at the Vuelta. Gerolsteiner's Robert Förster took the sprint, head of Stuart O'Grady, Danilo Napolitano, and Thor Hushovd. Milram's Alessandro Petacchi found himself boxed out by a late left-hander and didn't factor. After leaving the Giro early with a knee injury and missing the entire Tour de France, it was just too much to take. Frustrated, Petacchi took a punch at the team bus. Unsurprisingly, the bus won. As a result, Petacchi is out of the Vuelta, and will miss the world championships in Salzburg in 2 weeks. "I was very angry," explained Petacchi. "After being injured so many months, I had the concrete possibility to finally return to success. I wanted to give my season a sense at all cost, after I had to abandon the Giro d'Italia early because of my accident. "In any case, I admit it was a stupid gesture. I'm sorry and I ask my teammates and the team management to forgive me. But the anger was so intense that I couldn't control myself. I condemn my gesture very severely, but I am just a man, not a machine, and sometimes men make mistakes. Today I made a mistake, no doubt." Petacchi joins a number of (typically headcase) athletes who have missed action for outburst-related injuries, including the NBA's Latrell Sprewell in 2002. Might even break into this baseball-only version of the stupidest sports injuries ever, alongside Jason Isringhausen, who similarly broke his hand in a frustrated punch. Team Milram's supersprinter Alessandro Petacchi is back in the saddle. Petacchi fractured his kneecap during Stage 3 of the Giro d'Italia in May. Petacchi also missed last year's Tour, in preparation for the world championships, won by Tom Boonen. Petacchi is expected to ride tomorrow, but has no projected date to return to racing. Lance Armstrong, who would generally take over the World Cup lead with a strong Tour showing, moves only into 2nd in the new ProTour's post-Tour rankings, trailing Danilo DiLuca by 45 points. Alexandre Vinokourov will move up when Armstrong is removed from the listings: He's third, just 3 points behind Armstrong. Other Americans in the Top 20 are Levi Leipheimer, 15th at 80 points, and Bobby Julich, 16th at 79. 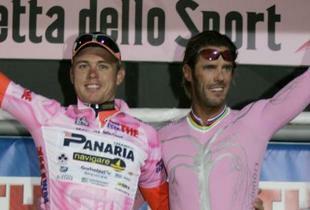 Italian supersprinter Alessandro Petacchi signed with Domina Vacanze for 2006 today. Petacchi's current team, Fassa Bortolo, will dissolve at season's end. Petacchi teammate Juan Antonio Flecha signed with Rabobank earlier this week. Petacchi committed for three years. Rumors had him insisting that several teammates come with him -- keep your eyes peeled for more announcements. Fabio Sacchi, Marco Velo and Alberto Ongarato are expected to move with him. Velo, of course, has the greatest possible cycling name. Petacchi's predecessor as king of the Italian sprinters was Mario Cipollini, who finished his career with Domina Vacanze. Update: Marcello points out that Cipollini took some starts for Liquigas-Bianchi, including a final win over Petacchi this spring, but I have trouble giving them credit for being his last team when he quit at the end of April. Silver Train to roll no more? procyling.com | Fassa team facing end of the line? ProCycling.com quotes L'Equipe (I can't find the original story online) that Fassa Bortolo is in danger of financial collapse. Team manager Giancarlo Ferretti is seeking a new sponsor to take over for the team's title sponsor, an Italian concrete company. He thought he had a deal lined up in the offseason with French bank Caisse d'Espargne, but they became secondary sponsors for Illes Balears a few weeks later. Panasonic, Philips, and Orange have all reportedly refused to step into the breach. “We have given ourselves one more week before we make a decision. After that, the riders are free to go where they want,” Ferretti said yesterday. Some rumors about who may go where: Juan Antonio Flecha to Rabobank and Kim Kirchen to Liquigas. The big prize, of course, would be Alessandro Petacchi, who is rumored to have had discussions with Discovery, T-Mobile, Phonak, and Domina Vacanze. Update: Eurosport reports that Discovery may also be after Fabian Cancellara. Alessandro Petacchi confirmed on Sunday that he's skipping this year's Tour de France to focus on the World Championships in Madrid, on a flat, fast course that looks well-suited to Petacchi's legs. His statement confirms his season plans as originally laid out in January. Petacchi's worlds teammate Paolo Bettini, who took the gold medal in Athens, may have something to say about that, as will Belgium's Tom Boonen (both of whom are expected to race the Tour, as well). Petacchi has won multiple stages at the last few Tours de France, and won four stages at this year's Giro d'Italia, including yesterday's final stage into Milan. Tom Boonen was the odds-on favorite going into Paris-Roubaix, but in a bicycle race, like a golf tournament, the favorites are never prohibitive. On a day when Tiger Woods took his fourth Masters championship, Boonen showed why they both were favored. As with Tiger, this Paris-Roubaix went the distance, with Boonen just edging out Discovery Channel's George Hincapie and Fassa Bortolo's Juan Antonio Flecha. Boonen, who also won the Tour of Flanders earlier this month, takes over the lead of the ProTour from Alessandro Petacchi, who has never started the Hell of the North. The 24-year-old, formerly a US Postal rider, has firmly established himself as one of the world's best one-day riders. Sunday's big move had 2004 winner Magnus Backstedt, Boonen, Flecha and teammate Fabian Cancellara, Hincapie, and CSC's Lars Michaelsen -- everything but a big sign that said "Winning break departing now." "I was on the last wheel and as we went round a corner Mickaelsen swung out and left a bit of a gap," explained Backstedt who finished fourth. "I tried to close it but just couldn't. The front three were just far too strong for me." Boonen said he had most feared Backstedt and Michaelson in a finishing sprint over the roleurs Hincapie and Flecha. Left with Hincapie and Flecha, Boonen picked their pocket, holding third position into the Roubaix velodrome, choosing his attack, and outkicking Hincapie for the win. Hincapie becomes the first American to make the Paris-Roubaix podium. CSC's Andrea Tafi, who won Paris-Roubaix in 1999, made his last career start, but withdrew early, as did Peter Van Petegem, among others. Former US Postal rider Victor Hugo Peña crashed in the neutral zone, before racing even got under way, and DNF'ed. Fassa Bortolo's supersprinter, Alessandro Petacchi, has previously announced he won't ride the 2005 Tour, to focus on worlds, and Oscar Freire is bound to target world's, since they're in Spain, so it looks like the stage is set for a major showdown in Madrid. "I'm satisfied, yet disappointed at the same time," said Hincapie, who couldn't counter when Boonen shot away high off the final turn in the velodrome. "This gives me even more motivation to come back here and win next year." Why did Hincapie let it go to a sprint against Boonen? [Discovery assistant DS Dirk] Demol added, "it wasn't possible to attack in the final 20 kms." On Boonen, he added, "every kilometer closer to the finish, we kept thinking 'how can we beat him?'" The second place finish moved Hincapie up into fourth place in the ProTour standings. CyclingRevealed | Flahute and "The Lion of Flanders"
CyclingRevealed.com offers a look at the Belgian Classics, and Johan Museeuw, who won Paris-Roubaix three times. Alessandro Petacchi isn't giving up without a fight at Tirreno-Adriatico. His Fassa Bortolo team did its thing, pulling off rider by rider, then letting Petacchi dance to the line. Mario Cipollini tried to jump off Petacchi's wheel, while overall leader Oscar Freire looked to outsprint Petacchi on the opposite side of the road. It was not to be, as Petacchi took his 11th victory of the young season, and 2nd of the race. "Contrary to the first day, this was a much harder sprint," he told Italian television. "It was punctuated by a number of irregularities. Freire launched the proceedings, but he's more at ease in slightly uphill finishes and I came back strongly." Freire then tapped Petacchi on the arm on a gesture of goodwill between the two hot favourites for Saturday's Milan-San Remo. Freire was 2nd on the day, Robbie McEwen 3rd, with Cipollini easing off to 7th and Baden Cooke 8th. With the time bonus, Petacchi moves to within 19 seconds of Freire, with only Tuesday's stage remaining. Oscar Freire hit a railing in the last kilometer, but sprinted free of the bunch to take a 2nd consecutive stage at Tirreno-Adriatico. As he was yesterday, Laurent Brochard of Bouyges Telecom was 2nd, and Gerolsteiner sprinter Danilo Hondo was third. Discovery's George Hincapie was 6th. Freire holds the overall lead, 10 seconds free of Alessandro Petacchi, who was 8th today. 4. Emanuele Sella, Ceramica Panaria, s.t. 5. Mirco Lorenzetto, Domina Vacanze, s.t. 6. George Hincapie, Discovery Channel, s.t. 7. Ruggero Marzoli, Acqua & Sapone, s.t. 8. Alessandro Petacchi, Fassa Bortolo, s.t. 9. Fabian Wegemann, Gerolsteiner, s.t. 10. Fabrizio Guidi, Phonak, s.t. It's been a long time coming, but the Lion King roared again today, as Mario Cipollini outsprinted heir apparent Alessandro Petacchi at the Giro di Lucca. Cipollini, now with Liquigas-Bianchi, has retired and unretired a few times already, but he showed great early season form, staying at the front when the field split, leaving Petacchi with only one teammate, rather than the long blue express train that has dropped him at the finish line of so many stage victories over the last few years. Petacchi has 8 wins this season, and Monday was his first loss in a heads-up sprint in 2005, as he finished behind Cipollini and Paride Grillo. Fassa Bortolo's super sprinter Alessandro Petacchi is having a scorching spring, taking three of five stages at the Volta Comunidad Valencia in Spain. "For me, with my characteristics, it is very difficult to win a small tour like this one, but I have been very fit since the beginning of the season and I knew that I could race a good tour," Petacchi said. Alessandro Petacchi has a cracked rib and a badly bruised shoulder, suffered last Thursday on Stage 5. Doctors estimate 30 days for complete healing, which makes Petacchi doubtful for the Olympic road race, scheduled for August 14. Alessandro Petacchi and Mario Cipollini have both withdrawn from the 2004 Tour. Petacchi won 4 stages in 2003, and 9 stages in this year's Giro d'Italia, but hadn't figured in a finishing sprint yet this year, and hurt his shoulder in a crash during Thursday's 5th stage. Cipollini blames his withdrawal on the injury that took him out of the Giro. Super Mario has never finished a Tour in 8 starts with 12 stage victories. A crash early on in the race had re-opened a major wound in Cipollini's shin - caused when he skidded across the road in a similarly lethal finale in the Giro - and gravel infected the inside of the wound. The pain proved too much for Cipollini, and Petacchi, suffering from torn ligaments from a crash on Wednesday, opted to join his fellow-Italian on a flight back to Milan from Paris.